What makes this new technology so important is that it enables four separate, new concepts, each of which is fundamentally disruptive in its own right. Taken together, the result is to open up an array of possibilities so vast that we are just beginning to explore its potential. REBNY is eager to explore potential uses of Distributed Ledger Technology across all facets of the real estate industry, including property databases, financial transactions, plans and project coordination, sales and leasing, and more. An immutable database, updated by an unlimited number of contributors, not necessarily relying on the trust of any one party and with no single point of failure. Real estate is all about physical structures, on geographically specific pieces of property, divided into individual units, that are occupied by individuals or entities, pursuant to legal contracts, with all of the above changing over time. Each of these component pieces of the puzzle can be represented by data (structural plans, floor layouts, tenant credit records, leases or sales contracts, etc.) and the industry already supports a plethora of separate databases in each of these areas. Some are public, some are proprietary. Some are freely available, some are extremely expensive. Some are static, some are active. Possibilities abound for putting some or all of these databases onto a/the blockchain. Advantages could include permanence, ease of access/distribution, ease of manipulation, integration with contracts, standardized entries, and more. The ability to create, identify and manipulate specific, non-duplicable, digital objects. One of the core concepts of the digital world that all Internet users have internalized is that a digital copy is identical to an original. If I download a movie and make a copy for you, now we both have the movie. What has made the blockchain so revolutionary is that for the first time a digital object can be unique, and retain that uniqueness through a lifetime of use and exchange, all without requiring an owner or trusted entity to mediate. The ability to create a new digital ‘token’ that can function as a medium of exchange—a ‘cryptocurrency’. 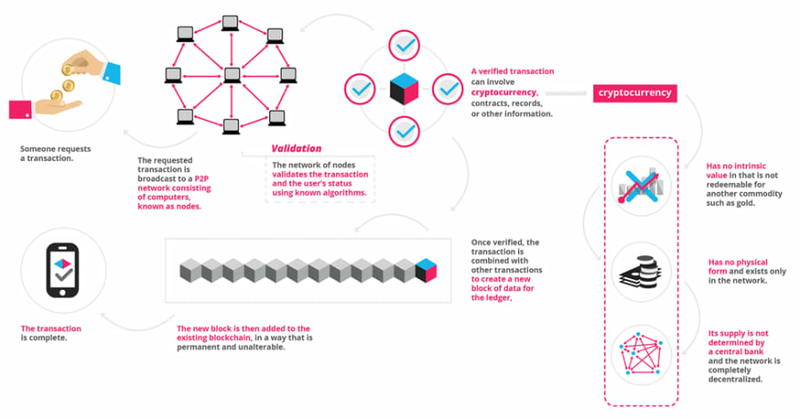 The ability to create a unique digital object therefore equates to the ability to create a new currency for value interchange. But whereas traditional objects used for value storage cannot be easily duplicated, they are also not unique and quantity-controlled (gold and diamonds can be mined; currency can be printed). Digital cryptocurrency tokens, however, are both unique and controllable, with publicly verifiable, permanently fixed rules about their creation and destruction. The ability to integrate digital objects, currency and transactions completely in the cloud through the use of ‘smart contracts’. With cryptocurrency tokens providing a digital means of value exchange, we now for the first time have the ability to directly and natively integrate economics into cloud-based transactions through ‘smart contracts’. Anything that can definitively ascertain or accessed digitally can now be integrated into an automated, self-executing contract. This is true regardless of the number of parties, conditions, time elements or value involved. Post questions for the category mentors here! The building construction processes in New York City have not changed significantly in the last several decades. Somewhere/sometime in the last fifty years, someone has built the same type of building, using similar processes, to one being built today. One of the bigger problems bedeviling the construction is ignoring proper project close-out, which includes identifying critical mishaps or “lessons learned.” Down the line, a contractor building the same type of building could have referenced previous “lessons learned” to avoid repeating previous mistakes. Implementing proper closeout might reduce the cost of construction consultants and make current contractors more competitive. Construction Put in Place” was $1,317 trillion. Architecture, Engineering, Construction (AEC) & Development, which is at the heart of that number, refers to the design and build phases of developed land, while development refers to the broader process of buying land, financing deals, building or renovating structures, leasing and managing properties, and often the sale of said properties. Many professions support the AEC & Development process, including architects, attorneys, brokers, engineers, environmental consultants, general contractors, insurers, lenders, project managers, site planners, surveyors, subcontractors, construction trades, and more. How can technology improve site safety? How can job site communication be made more collaborative? How can visualization improve production efficiency? How can technology help Developers review and approve the monthly pay requisition based on real-time site monitoring? How can predictive analysis help contractors create accurate project schedules and allow for day-to-day updates? How can algorithms help architects design the most efficient use of space to maximize office population while reducing the cost of construction, and be code compliant? How technology help us create a dashboard of factors that is public knowledge (news, Interest rates, real estate transactions, pending land use approvals, risk factors, and overall SWOC (Strength, Weakness, Opportunities, Challenges) in order to make more informed decisions? Accidents occur on site because workers have not been adequately trained in safety precautions when working on site. Virtual and Augmented Reality technology can allow workers to gain critical site safety experience in simulated high-risk situations. Additionally, research has shown that after an hour of instructor lead training most trainees lose focus. VR technology has been proven to keep the attention spans of visually orientated people and improve recall for future safety hazards. Keeping track of construction site safety logs, as well as training certificates and licenses mandated by the Department of Buildings (DOB), requires immense effort at the site level. Identification cards for all site personnel mandated by the federal Occupational Safety and Health Administration (OSHA) and DOB need to be physically present at every site for the site safety manager to review. This results in wasted labor as cards are often forgotten at home, lost, or expired. But all this information is already recorded and filed in DOB/ OSHA databases. How can these public databases be integrated with Site Safety programs on the job site, so that workers are not turned away because of missing documentation? What ways can technology be physically deployed on-site to improve safety? Improved harnesses, barriers, warning systems, equipment lockout, or performance monitoring? This is simultaneously the most obvious and most difficult challenge in construction, as it involves coordinating dozens of different firms on a single project. Google Flux was created to share real-time models, marks ups, and data between architects, engineers, and construction managers, but even Google, with its enormous resources, recently pivoted away from trying to solve the problem—because, despite their best efforts, no one would use their collaborative software. The resources and effort put into the coordination process between all of the companies in the AEC process is tremendous, and numerous errors and mishaps result from the breakdown in their lines of communication. Even small advances here might have a great impact. The savings in every facet of the design and construction process could be immense if collaborative software was implemented and used by all parties involved in building construction process. How can this collaboration be implemented, and perhaps more importantly, incentivized? A project-based software application utilized by all of the design team, construction manager, and subcontractors, could fast-track the submittal process, reduce overhead, reduce errors and omissions between the design teams and construction manager’s contractors, and reduce the overall project duration by eliminating coordination, review and approval times. Job site communication between subcontractors and their workers might be improved through project-based communication apps (e.g. sending out instructions, safety highlights, or memos on a per site basis). Most of construction is a combination of receptive processes that are taught at the site level to new workers. All subcontractors rely on their employees to educate their new hires and to efficiently install the required work. Part of the bidding process is identifying competent subcontractors who have the skilled labor to efficiently and cost-effectively complete the required job. With the current shortage of skilled labor, it is becoming harder to identify and educate competent personnel for the required work. Virtual reality might be utilized to educate workers on the best construction practices for their respective trades and thus improve the competency of the new labor. Construction errors are subject to the Pareto Principle: 80 percent of problems are caused by the same errors, time and again across different projects. Virtual reality might increase the competency of construction superintendents and project managers by immersing them in a VR simulation that identifies high-risk areas for whatever type of project they are on. Despite the existence and use of CAD software and computerized Building Information Modeling (BIM) systems, a great deal of time is spent before, during and after construction in coordinating plans, drawings, and “as-built” documentation. How might systems combining scanning, visualization and design integration improve this process? How can technology help developers review and approve the monthly pay requisition from the contractor based on real-time site monitoring? At the site level, there are hundreds of software solutions for requisitions, safety logs, equipment tracking, timekeeping, etc., but the biggest issue for the industry is that no subcontractors are using them. How might new technology or business models get subcontractors to utilize the available software on site and still be competitive? At the end of the workday, drones might be utilized on-site to scan and compare existing conditions against a fully-built 3D BIM model of the building. Numerous mistakes are encountered between physical building components being installed in the incorrect locations or at the wrong elevations. What other uses might drones or other autonomous devices have in the construction process? Monitoring, safety, assembly, documentation, verification, security…other areas? How can technology improve the collaboration between the design team and construction team? How can we utilize technology to reduce field and design errors among all members of the building construction team? How can technology reduce overhead and improve the internal efficiency and productivity of construction subcontractors? How can we get subcontractors to fully integrate technology into their operations? How can virtual and augmented reality be utilized in the building construction industry? If architects begin design from a clean slate for every project, can we utilize technology to create a standardized database for the schematic and design development stages of building plans? How can technology improve the Mechanical, Electrical and Plumbing (MEP) coordination process? How can technology improve equipment tracking for building maintenance staff and construction contractors? How can technology improve site monitoring for the CM/GC construction team? How can technology help contractors retain “lessons learned,” at the end of the job to improve future construction productivity and reduce errors? How can technology be used to compile a database of trade specific construction standards and building type construction processes that can be utilized by future contractors for improved efficiency and productivity? Property operations and maintenance refers to the monitoring, control, and oversight of physical assets within a building. Whether under the banner of sustainability or innovation, this sector focuses on a combination of the deployment of new and retrofit technology, and the implementation of new operational behaviors. Property managers and facility operators use building metrics to improve performance, while creating healthier spaces that are more comfortable for tenants. Property management is undergoing a transformation as new and existing data streams are being intelligently collected, new data relationships created, while machine learning, predictive and prescriptive analytics are being utilized to make this data instructive and useful. How can predictive analytics, artificial intelligence and machine learning improve energy procurement? How can predictive analytics, artificial intelligence and machine learning improve building operations? How do we maintain efficient performance levels attained between 10-year retro commissioning cycles? How do we safely use facial recognition in our security systems? How do we position our buildings to be adaptable to rapidly changing technologies that become available? How can tenant experience applications help drive the overall efficiency of built spaces? Real estate brokers are experts at understanding real estate market conditions and negotiating transactions for the sale or lease of real estate. Commercial brokers manage sales of investment properties and leasing of retail and office space, working with individuals and institutions to realize financial goals while ensuring the best and highest use of built space. Commercial brokers are looking to the technology development community to address how technology can address and / or solve the pain points of problems encountered during the ongoing commercial transaction of real estate solutions and services. How can technology help us better manage the transaction process for our clients? What software tools would assist decision makers and stakeholders in the real estate process in the communication, consensus building, decision-making, and coordination of all steps within the transaction process? How can technology assist in the creation of a toolkit software services for tenants and their advisors when analyzing and comparing site selection options (e.g. weighted matrices of variables, process and site selection tools/software)? How can technology assist in data aggregation, sorting of data, and visualization of that data, of tenant information within buildings and portfolios of buildings? How can technology assist in the creation of “smart” stacking plans of buildings with all relevant tenant data – square footage, lease expiration, trigger dates (renewals/terminations / must-takes, ROFO’s, etc.)? How can technology solve the CRM “problems” still facing tenant representation advisors/brokers within leasing – current CRM solutions are either too bulky or don’t address major pain points of business development and transaction professionals within commercial leasing? How can technology help with the collaboration and innovation within an organization around leasing and commercial transaction teams integrating and communicating with other service lines (e.g. capital markets, retail, industrial, etc. )?